The rich always strive to get richer, and the NFL lockout is another perfect example of this: The super-wealthy team owners have opted to end their agreement with the players, citing “unfair” financial burdens as their reason. The disagreement essentially stems from the fact that the owners claim that their financial risks ought to be rewarded by a greater share of the league’s $9 billion annual profits; the players have expressed skepticism regarding these financial burdens, doubts which have only been solidified by the fact that the owners have repeatedly refused to open their books for inspection. Though the players’ doubts may well cost them the 2011 season, the owners are relatively unconcerned – after all, they stand to make a $4 billion profit even if there isn’t a single game played. We should all take a lesson from the football players of the NFL because a healthy dose of skepticism can be excellent armor against the unfair maneuvering of those in power. And no one has a greater right to skepticism than the modern American parent. Parental skepticism should begin on the first day of Kindergarten, for it is on that day that an endless round of misleading report cards begins. Rather than grading students based on their actual performance, teachers at the elementary level often employ a confusing and highly subjective system of stars and smiley faces. Even those schools which stand by the traditional letter-based grading system are prone to incredibly subjective grading, resulting in report cards which are a truer reflection of the teacher’s relationship with the student than of the student’s performance in class. It is important to utilize every resource available to you in order to ensure that your child’s learning achievements measure up to his grades – consider signing your child up for a diagnostic exam through a third party such as C2 in order to get a more in-depth look at your child’s strengths and weaknesses. Remember when a C was considered average? Those days are long past: 45% of the high school class of 2009 graduated with an A average. Is an A really an A if everyone gets one? Grades are rising, but test scores are falling: From 1992 to 2005, the percentage of high school seniors scoring proficient or better on the Nation’s Report Card Reading Assessment dropped from 43% to 36%. During roughly the same time period, average high school GPAs rose from 2.68 to 3.0. School districts sometimes force teachers to inflate grades. For example, several Texas school districts mandated that students be given a minimum grade of 50 or 60% regardless of actual performance. The problem was so widespread that the state had to pass a law banning forced grade inflation. The percentage of high school graduates who signed up for rigorous-sounding course names nearly tripled in the last 20 years; over the same time period, the results of the federal test that measures changes in achievement levels have remained the same and SAT scores have dropped or flat-lined. In a recent Department of Education study, researchers found little correlation between course title and course content: “The [course] titles didn’t reveal much at all about how advanced the course was,” said Dr. William H. Schmidt of Michigan State University. However, most educators agree that even students who fail the AP exam benefit greatly from taking the more rigorous course. Simply being exposed to the more demanding coursework and the greater amount of work helps to better prepare students for college; even students who failed the AP exam will be more likely to succeed in college level courses having already been introduced to college expectations. If you have a child who is interested in taking AP courses but is worried about the rigor of the coursework, consider speaking with a C2 program director. C2’s programs can help prepare students for upcoming AP classes or for the AP exams each May. Because there is so much obfuscation surrounding high school transcripts, college admissions officers are left in a bind: How does one evaluate students from across the country if their course selections and grades are misleading? The simplest solution is to cull students from high schools with longstanding reputations. This is why students from the nation’s top public and private high schools are so highly overrepresented at Ivy League colleges. As college admissions has become increasingly competitive, parents have placed educators under increasing pressure to give higher grades in order to make their children more attractive to colleges. Likewise, public high schools prefer to show higher average GPAs in order to improve their standing and gain additional funding. This data might suggest that our college students are stronger today than they were fifty years ago. However, a study released earlier this year revealed that today’s students spend roughly half the amount of time studying than students did a few decades ago, and 35% of college students today say that they spend fewer than 5 hours per week studying. These two trends suggest that rather than our students getting stronger, our colleges are getting easier. College grade inflation occurs across the spectrum, but the worst offenders are private schools. Over the past few decades, the average GPA at private schools has increased at a far faster pace than the average GPA at public schools; today, the average GPA for private schools is 3.3, compared to 3.0 at public schools. These schools, which cost, on average, well over twice as much as public schools, offer a significant advantage to their students when it comes time to apply to graduate school or find a job. In fact, the study’s authors suggest that this rampant grade inflation might explain why students from private schools are so overrepresented in top medical, business and law schools. Grade inflation is yet another chapter in the long, sad story of wealth disparity in education. Those with the means to do so pay large sums of money to send their children to the top private high schools, thus ensuring admission to the nation’s top private colleges, where professors and administrators make sure that their students graduate with artificially high GPAs that guarantee admission to the nation’s top graduate programs. 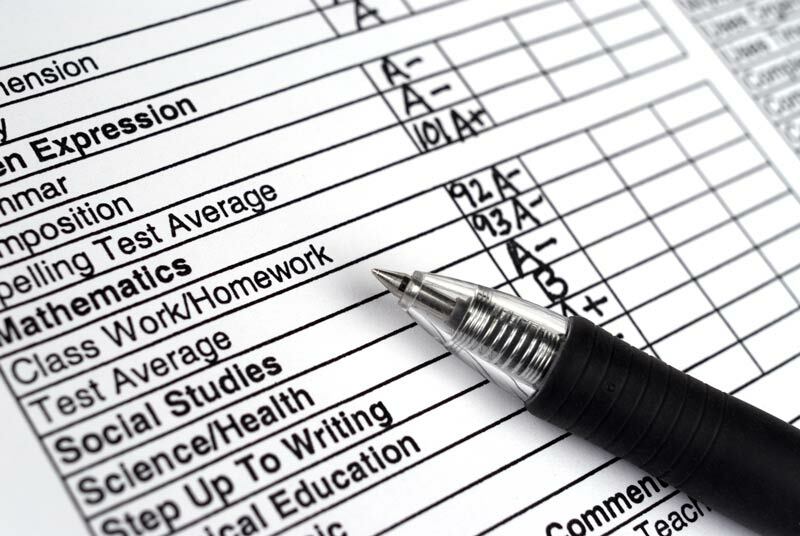 So the next time that your child brings home a straight-A report card, make sure you look beyond the grades. Ask your child what he/she learns in school; look at your child’s textbooks to familiarize yourself with course content; communicate with your child’s teachers to get a sense of their grading practices. Consider speaking with a C2 representative for additional help with interpreting your child’s report cards, ensuring that your child is performing at the highest level possible, and overcoming the hurdles to being accepted at his/her dream school. And always remember: Grades are meaningless without the hard work and knowledge to back them up.